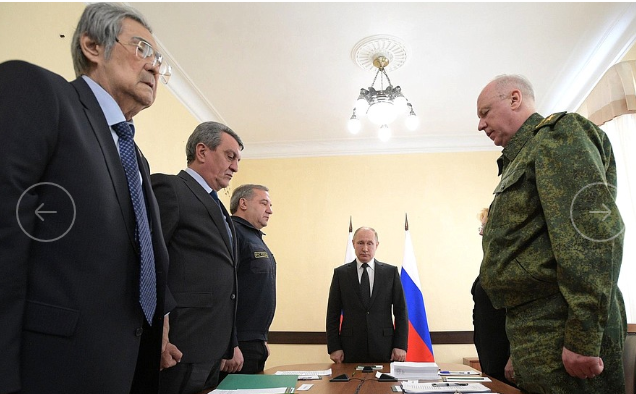 Aman Tuleyev (second image, centre) was re-appointed by President Vladimir Putin (lead images, left) to his fifth term as governor of Kemerovo region on April 16, 2015. No governor of a Russian province has served for twenty-one years with such a display of confidence from the President. For this period Tuleyev has been responsible for the corrupt culture of the region; everyone in Kemorovo knows it. 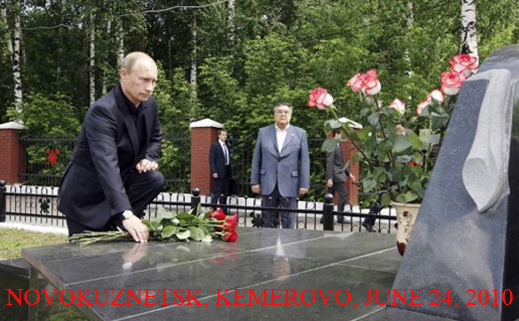 On Tuesday in Kemorovo city Putin was told so by a local resident. For the eleven-year file on Tuleyev’s crimes, stories of those whom he has falsely accused, as well as reports on those he has enriched in consequence, open the archive. 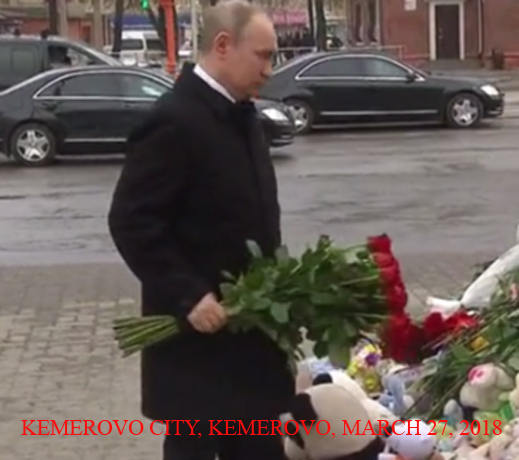 The Kremlin has reported the briefing by officials which Putin received in Kemerovo on Tuesday morning, following the fire on Sunday evening at the Kemerovo city mall known as Zimnyaya Vishnya (“Winter Cherry”). The official photograph shows Tuleyev at the table (pictured below, extreme left) with (left to right) Presidential Plenipotentiary Envoy to the Siberian Federal District Sergei Menyailo; Emergencies Minister Vladimir Puchkov; Healthcare Minister Veronika Skvortsova; and Investigative Committee Chairman Alexander Bastrykin. Bastrykin has so far not reported opening an investigation in Cyprus; sources in Limassol report the name of an asset holding company and of a Russian who manages what are alleged to be Tuleyev’s offshore assets. There is no evidence to substantiate the claim that Tuleyev is one of the “prominent Russian investors” identified as owning Emerald Coast Properties Limited, established in Cyprus in 2006. Tuleyev’s annual asset and income filing required by Russian law discloses no foreign assets or foreign income. Putin was also briefed on the response of the medical rescue and hospital services by Health Minister Skvortsova. She reported that 70 surviving victims have been treated at local hospitals; two of them remain in critical condition. Skvortsova did not give the president an estimate of how many died in the fire. Russian media reports, and a count at the city morgue, indicate 58 dead, with a search still under way at the site of the fire for six people listed as missing, presumed dead. More than 700 people were evacuated from the burning building by firefighters and rescue teams. Skvortsova told Putin: “the tragedy is immense but the experience we gained thanks to you at the Raspadskaya mine is being used to the full.” She was referring to the methane explosions at the Raspadskaya coalmine in Mezhdurechensk, Kemerovo region on May 8-9, 2010. Ninety miners and rescue crew were killed. Left: Kemerovo mall fire; right, Mezhdurechensk mine fire. At the time, Putin, then prime minister, expressed his view that company policies were responsible for the failure of methane detection systems to operate. He said at the time: “This is a big burden on stockholders and owners. They’ll have to pay this from their own pockets.” Putin then changed his meaning: “in our estimate, the effectiveness of the industry is now high enough to allow the shareholders and owners of these companies to increase investments in safety. But I repeat, I promise that we’ll consider this issue. We’ll support the owners, relieving their burden even though it will result in lower budget revenues. We’ll consider this issue.” For details, read this. For the connection between methane explosions, miner deaths, and coal company capital in Kemerovo, read this, published weeks before the Raspadskaya disaster; then this, one week after the disaster. The principal stockholders in the mine at the time were Roman Abramovich and Alexander Abramov. Putin summoned them to a meeting for a dressing-down by video-link. 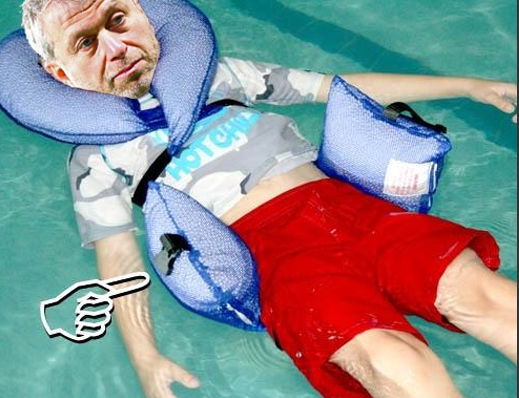 For Abramovich’s continuing record of non-compliance with federal safety law and regulations, and Tuleyev’s complicity, read this story from Novokuznetsk last October. Following this meeting Putin visited victims at the hospital. Putin told one of the injured “Get better”. Half an hour later, Putin met with a crowd of relatives of the victims. 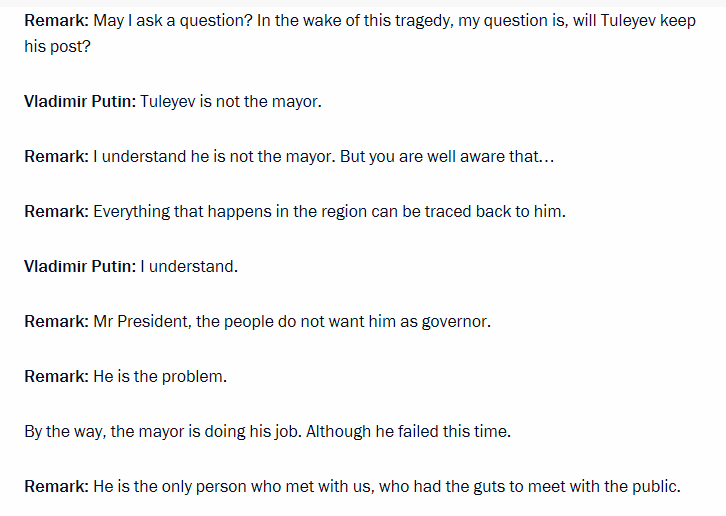 He was asked directly about Tuleyev.